Chocolate bark is one of the easiest, cheapest and yummiest sweet treats and you can make hundreds of versions by combining chocolate with various ingredients. You can make it with your favorite kind of chocolate. Ours is always dark with 70% chocolate to make this treat since we love to sweeten and enrich it with some other ingredients. You could use white or milk chocolate too, you can even combine them all if you like! Everything is up to your taste in this treat and we are going to share our new favorite combo with you in this recipe. We loved the couple of pomegranate and chocolate when we tried them together in one of our favorite tarts, so we decided to combine them in some other recipes too. When I saw Liv’s Pomegranate Chocolate Bark at pinterest, I just admired and I thought we must try it too! Go check her post to find another great recipe for a unique pomegranate champagne cocktail besides her lovely chocolate bark. 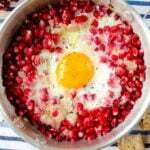 She definitely knows what to make with pomegranate seeds! It was Yusuf’s idea to add some pretzels too, he loves sweet and savory together. It’s not something typical in our cuisine and I’m not very used to it, but I was intrigued by the idea. The result was amazing! We combined sweet, savory and sourish flavors in this recipe and ended with this addictive chocolate bark! The crispiness of pretzels and the freshness of pomegranate seeds make this chocolate bark unique and your guests will love it! You can even prepare edible gifts and surprise your friends at any holiday celebration with these. The best part is the simplicity of this wonderful treat. It takes 15-20 minutes to prepare and wait it in refrigerator for about 2 hours. Break or cut it randomly into pieces before serving and grab the largest piece for yourself! Chocolate bark becomes unique with these savory and sourish flavors! Let it reach room temperature and toss in half of the pomegranate seeds into it, mix well. Line a baking pan with parchment paper and pour chocolate on it and smooth out into your desired thickness. Sprinkle the other half of pomegranate seeds over chocolate poking each one gently. Sprinkle pretzel pieces over chocolate and poke them too. Let it cool for about 2 hours until the chocolate is har enough to be broken into pieces. This looks gorgeous! One question – how long can this last given the pomegranate seeds are fresh? If I was to give this away for Christmas, how far in advance could I make it? Michelle, It shouldn’t be more than two days to keep the frehness of pemegranate seeds.